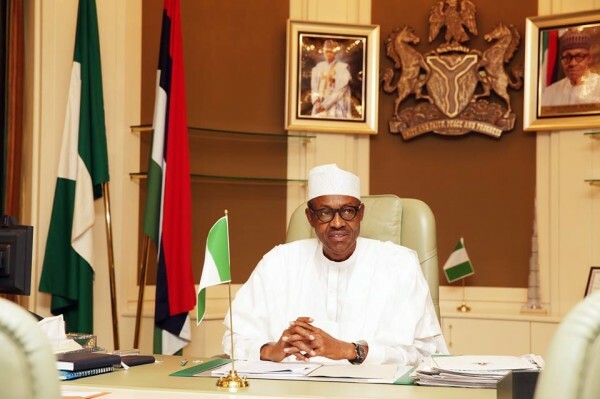 President Muhammadu Buhari is right now in a closed door meeting with the leaderships of the All Progressives Congress (APC) and the Peoples Democratic Party (PDP) at the Banquet Hall of the Presidential Villa, Abuja. The meeting begun around 11.10a.m and is still ongoing as at the time of filing this report. The meeting has in attendance the Vice-President, Prof. Yemi Osinbajo, chairman of the APC, Mr. John Odigie-Oyegun and the caretaker chairman of the PDP, Sen. Ahmed Makarfi. Other APC members attending the meeting include the National Legal Adviser of the APC, Muiz Banire, Sen. Olorunnimbe Mamora, Prince Tony Momoh, former Senate President,Ken Nnamani amongst others. Those from the PDP are Sen. Ben obi and other members of the caretaker committee. The meeting might discuss socio-political issues especially the problem of hate speech and the prevailing security situation in the country.